Factory Sealed Upper Deck Series 1 Hockey Hobby Box mit 24 Packs a 8 Cards per Pack. 6 Young Guns Rookie Cards per Box - dazu 2 Jersey Cards per Box ! 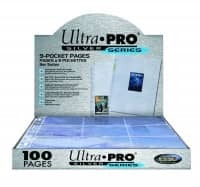 Produktinformationen "2012/13 Upper Deck Series 1 Hockey Hobby Box"
Factory Sealed Upper Deck Series 1 Hockey Hobby Box mit 24 Packs a 8 Cards per Pack. 6 Young Guns Rookie Cards per Box - dazu 2 Jersey Cards per Box ! Weiterführende Links zu "2012/13 Upper Deck Series 1 Hockey Hobby Box"
Fanbewertungen für "2012/13 Upper Deck Series 1 Hockey Hobby Box"